Dimensions: 13 1/4" x 12"
As an artist, Jacques Gruber flourished during the artistic renaissance provoked by Art Deco in France. He studied at Paris School of Fine Arts in the 1890s and became friends with many influential artists of the era, including Gustave Moreau and Georges Braques. Gruber taught at the Nancy School of Fine Art for most of his life, and was very successful in the artistic community. He collaborated with manufacturers and craftsmen, and even designed menus and programs for local printers. His true passion, however, was always stained glass, and in this medium, Jacques Gruber became a master. 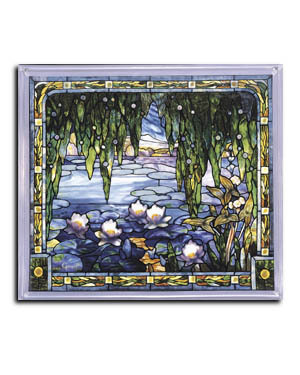 Lily Pond, reproduced from the original stained glass in the Virginia Museum of Fine Arts, is representative of the exquisite artwork of the Impressionist era. Stained glass is the perfect medium for this idyllic scene as the play of light among the water and foliage enlivens the landscape, lending it a sense of harmony and tranquility.